Our Custom Vinyl Golf Cart Wraps look like custom paint jobs and we should know because that’s what we did before we wraps were invented.- Since the creation of the large format printer we can now offer a full-color vinyl print that wrappeds around your golf cart at a fraction of the cost. Wraps are available in many colors, patterns, and styles. 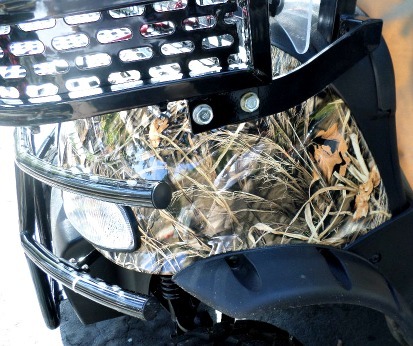 anything you want to put on your golfcart. Choose from a camouflage look to metal effects or or totally Kustom. The graphics are applied directly to the surface of your golf cart using a peel & stick application. A kit will consist of several large sheets of graphic film. There no need for a lot of extra tools. With the help of a friend, you wrap the complete body of the golf car using a heat gun or hair dryer. You Can change or remove it. If you decide you want a change or want it off, the sheets of laminate are removable (but will leave some adhesive residue) if removed within the first couple of years of applying it.